The saint who is accredited with inspiring this church, St Aelhaiarn, also has a couple of other dedications in Wales, one being a church in Caernarfon, the other being a well in Gwynedd, he also has a granite monument dedicated to him in Verberie, France. Historically, what we know about Aelhaiarn is this. He was one of three brothers and Aelhaiarn, with his brothers Lwchaiarn and Cynhaiarn lived in the latter half of the 6th Century. He was also a member of one of the ruling families of Powys and a benefactor of the British Church, which elevated him status upon his death to that of local saint. 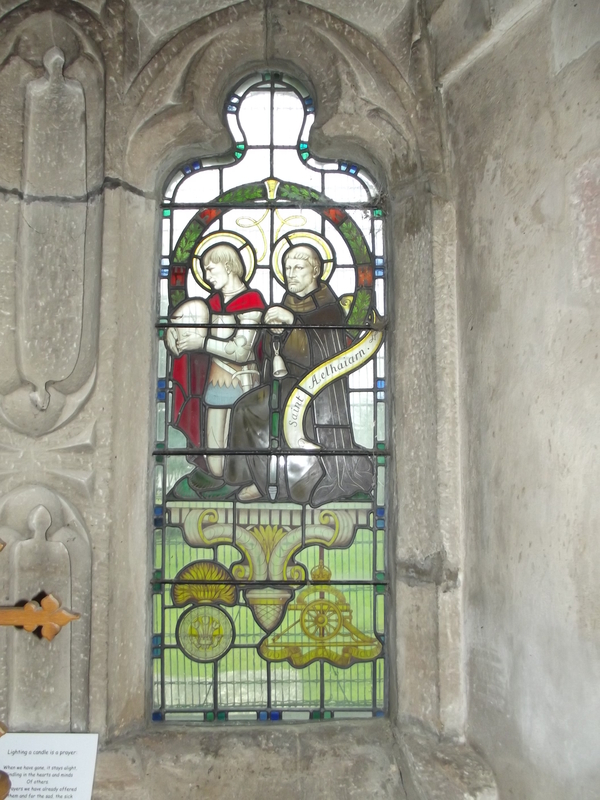 His festival day is the first of November, which coincides with All Saints’ Day and it is thought that the Church in Guilsfield was originally dedicated to All Saints before being rededicated to St Aelhaiarn. Not much is known about Aelhaiarn’s early life but piecing together different historical descriptions, as well as some of the more fanciful stories, it is likely that Aelhaiarn was born in Powys before going to North Wales to study and practice his religious beliefs, whilst being trained under St Beuno. He was made a Deacon before returning to Mid Wales and inspiring, if not founding, the Church that was on the current site in the late 6th Century. put him back together. The only problem was that, as it was the middle of the night and therefore very dark, he couldn’t find one of the eyebrows. So, the clever man that he was, he decided instead to use the metal tip of his pikestaff as a replacement, leaving Aelhaiarn to go through the rest of his life with an iron eyebrow, which, as we know, is what his name translates as.